In A Vase On Monday ~ "Singing In The Rain"
It was one of those mornings where there was a constant background noise of dripping outside. There was evidence of rain in the night which then returned on and off. Fortunately it was just in slight drizzle form so it didn't stop me from completing the task in hand. I have been tidying up my potted collection of named snowdrops and getting them back into some semblance of alphabetical order. I'm sure that they play musical snowdrops when my back is turned. It brightened up as the day went on so much so that there were some patches of blue sky and a hint of weak sunshine. The dripping noise gave way to the gentle flutter of yet more descending leaves. Job done I turned my thoughts as to what I could pick for this week's 'In A Vase On Monday'. I didn't have to think for long. These chrysanthemums have been strutting their stuff for a couple of weeks or so now. The plant was gift from a fellow allotment plot neighbour, who is also the most talented of cake makers and just as generous with cake gifts as with plant gifts. Earlier in the year he persuaded me to take a cutting of what he thought was a creamy coloured chrysanthemum! Obviously a case of mistaken identity. It's not a colour that I would have chosen myself but these very yellow flowers have certainly been sparkling on dull November days. I'm not sure whether this particular chrysanthemum is hardy but if it comes through the winter it will make the journey from my cold frame to the allotment. The vase in the shape of a milk jug was another charity shop find. It's probably difficult to see as the photo was taken in fading light but it is decorated with a seasonal band of oak leaves and acorns. Thanks to Cathy over at 'Rambling In The Garden' for adding song and sparkle to Mondays. In A Vase On Monday ~ "Three Is A Magic Number"
"I've enjoyed this meme but have not participated up to now, the main reason being that I do not pick many flowers to bring into the house. Maybe the odd snowdrop posy will make it indoors in the winter and then throughout the summer bunches of sweet peas picked from the allotment come home with me two or three times a week. 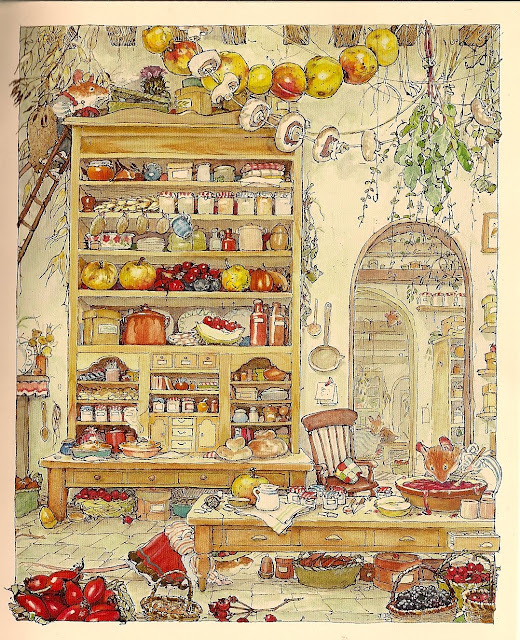 Other than that I have never really made a habit of picking flowers for the house." A trio of milk bottle vases bought on holiday this summer with 'In A Vase On Monday' in mind. A trio of flowers namely three stems of persicaria amplexis 'Firetail', six stems of the annual scabiosa stellata 'Sternkugel' and a stem of 'New Dawn' roses. Unfortunately I was unable to find a rose stem bearing any multiple of three. A trio of 'Wee-B- Little' pumpkins for some seasonal decoration, which I've squirrelled away, as part of my autumnal store cupboard. My cupboard sadly is sadly not as prolific as the wonderful bursting to the seams dresser in Jill Barklems's illustration from 'Autumn Story', a copy of which is is nestled behind my vases. "One thing alone changes rapidly at this time of year, and that is the colour of the leaves on the trees. They are as bright as flowers, and replace in gaiety the fruit we have gathered from the garden. But even this change is slow as compared with the rush of spring, when the leaves burst from their bud and clothe the trees in a flash of time. Since the beginning of September the leaves have been turning, varying in date with tree and weather. Weeks of calm will keep the leaves on the trees, as though they were forgetting to fall. They will be torn off in one night of wind. All the leaves by now have returned their sap to the tree, except the undramatic walnut which, like the ash, refuses to end it year in a blaze of colour, and lingers until the frosts strip off the leaves and scatter them at its base in a dirty, blackish green heap. The garden now is riotous in colour, in graduations of yellow and gold, bronze and crimson. We are reconciled at this moment to our smoke-grey, for it is an unequalled foil to these flaming leaves "
~ words from 'Four Hedges' by Clare Leighton. ~ illustration by Lena Anderson. That "one night of wind" arrived in Cumbria on Friday night. Spending what will probably be the last weekend of the year in our caravan, I was awoken by a tremendous noise of the wind in the early hours. It took a long time to go back to sleep as the roof was hammered by falling autumnal debris. Come morning I peeked out of the door to see that in just one night almost all the glowing red leaves on my little acer had been stripped from the tree. Has that significant one night of wind arrived in your neck of the woods yet? In A Vase On Monday ~ Nearly But Not Quite. Today's 'In A Vase On Monday' was nearly a solitary stem of roses but I could bit bring myself to snip it as it could well be the last of the year. There are buds still to open on 'Blush Noisette' but they will probably be zapped by the first frost of autumn whenever that arrives. Today's vase was nearly a cloud of the white cosmos bipinnatus 'Purity' but I have not made it to the allotment. There is a distinct chill in the air and no sun about. Wimp that I am plans to work on the plot were shelved. So instead in today's vase are a couple of now going over heads of ivy flowers, the dangling flowers of leycesteria formosa, the intense purple of salvia 'Amistad', aster' Little Carlow' (yes I know that asters are now called something else), the purple foliage and tiny fuzzy flowers of perilla frutescens, some asparagus foliage and the crimson tapers of persicaria amplexicaulis 'Firetail'. The latter was the only plant that I bought at the Malvern Flower Show last month. For some reason I didn't have my plant buying head on, as not only did I come home with one solitary plant it's one that is already growing in the garden! Having said that it's a really good do'er which flowers for months, so I'm more than happy to have a spare. More about the perilla in another post. 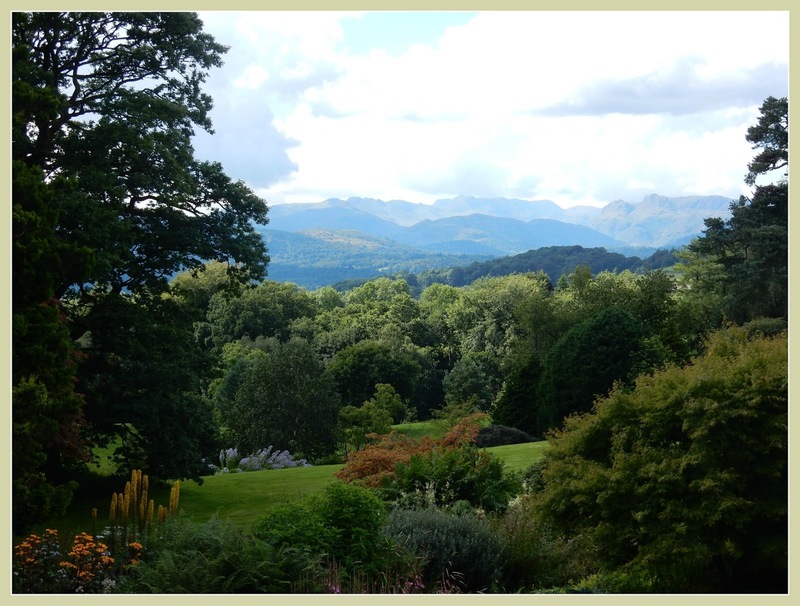 The garden is slowly coming to a standstill flowering wise but there are signs of exciting times ahead. The first snowdrop of the new season is already through and showing white! Thanks as always to Cathy over at 'Rambling In The Garden' for hosting. Almost Wordless Wednesday ~ A Worisit? This shrub stopped me in my tracks on Saturday morning when strolling along admiring the fabulous plantings on the promenade at Grange-over-Sands, Cumbria. It was singing out on a most dull and wet morning. My photograph taken from underneath a ginormous black umbrella doesn't do it justice. Would love to know what it is. Today's vase was foraged yesterday during the course of a late afternoon constitutional. We have spent a long weekend at our caravan in Cumbria. The heavy rain of yesterday morning cleared enough for us to stroll the mile or so to the local pub for Sunday lunch and then back again. We were briefly able to kid ourselves that it was still summer on our return so sat out with afternoon coffee and a read. The sun however loses its strength all too quickly at this time of year, so we retreated back in for a while, before deciding to stretch our legs again whilst it was still light. We have what has become a regular 40 minute or so circuit, which takes in a country lane, a small village, then a dirt track before we enter an underpass where we invariably pause to sing and shout and enjoy the echoes. Fortunately we have not as yet encountered any other pedestrians in the underpass. Then on to the main but still quiet road that leads to the caravan park. My eyes were peeled as we ambled so I was able to fill my impromptu vase of a beer glass on our return. 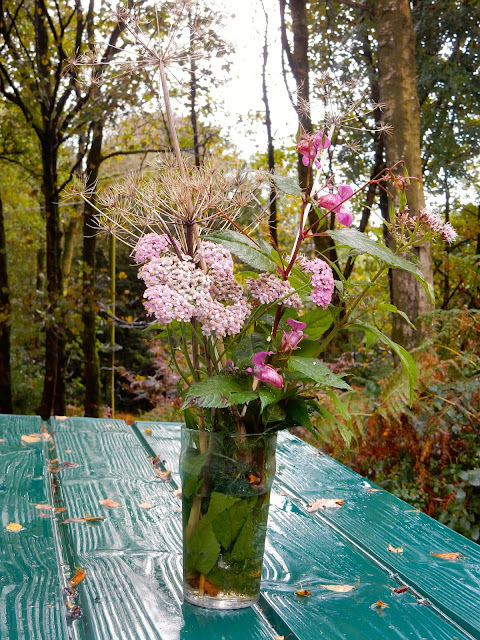 In the vase are achillea, a stem of the pretty but extremely invasive impatiens glandulifera, some seed heads (probably cow parsley) and some what I think is is eupatorium cannabinum. The rains descended with a vengeance before we returned, so my pickings were rather unceremoniously jammed into the glass before I retreated inside. Here they are this morning perched rather precariously on the storage locker at the side of the caravan. As always I'm intrigued to see what other participants have in their 'In A Vase On Monday' posts today. Thanks to Cathy over 'At Rambling In The Garden' who is not only a dedicated but also a charming hostess. The contents of this week's 'In A Vase On Monday' were picked and photographed last week but for some reason I didn't to get time to compose a post featuring them. I forget what prevented me. Some seven days later the same flowers were still going strong at the allotment so perhaps using last week's photo is not really cheating. What do you think? Sweet peas from seed that was sown in the middle of March. The wigwam made up of these did much better than the sweet peas sown at the beginning of March, both in terms of general vigour and quantity of flowers. Cornflower 'Blue Ball' which have been more impressive than their darker 'Black Ball' siblings. I've not grown cornflowers for years but sowed these back on 17th March. The plants became rather straggly and soon needed propping up. They have been in non-stop flower since at least 20th June, so nearly four months later I think they deserve the accolade of being 'good doers'. Plant numbers will be reduced though next year. Four plants of each was more than enough. Cosmos 'Double Click Cranberries'. These grew into rather substantial and sturdy plants which have flowered for most of the summer. Sadly they flopped when I picked them for the vase so their heads are looking down in the above photo. However they had perked up noticeably by the next morning. Cosmos bipinnatus 'Purity' has been a disappointment this year making tall and lanky plants which have only just come into flower in the last couple of weeks or so. I grow this most years and have not encountered the same issue before. I clocked cosmos bipinnatus 'Pysche White' in a display at the Malvern Autumn Show last month. It has most attractive small semi double white flowers and it's made its way onto next year's seed list. The last of the quartet is symphyotrichum 'Little Carlow'. This is a really fabulous and easy going autumn flowering plant. I have sung its praises here more than once in the past when it still went by the much more user friendly name of aster 'Little Carlow'. As well as being pleasing to the eye it's also beloved by pollinators. The plant at the allotment was visited by both bumble bees and honey bees in this morning's pleasant sunshine. Thanks to Cathy over at 'Rambling In The Garden' as always for her hospitality and encouragement to share our flowers at the start of each week. Ushers in a drearier day." ~ Poem 'Fall, Leaves, Fall' by Emily Bronte, 1818 -1848. Today is National Poetry Day. This year's theme is messages. This was obviously when the wedding breakfast was still fresh - not a single sign of cobweb. Looking forward to seeing the contents of other vases this week and with thanks as always to our hostess Cathy over at 'Rambling In The Garden'. A gift this morning from one of my fellow allotment plot holders. All I know is that it's tender. 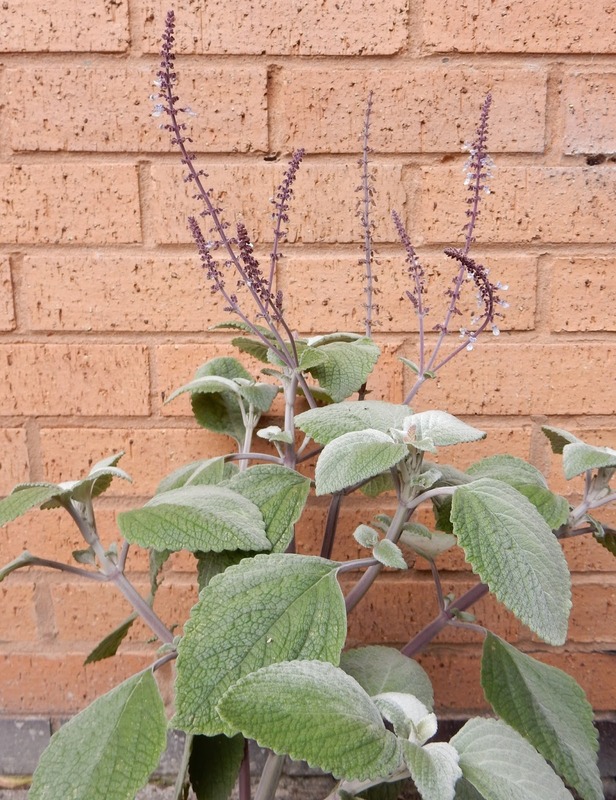 I have an inkling that it might be a plectranthus but am not sure which one it is. Confirmation of its identity would be most welcome. I also came home with some delicious looking sweetcorn from another plot neighbour. For some unfathomable reason I didn't grow sweetcorn on my own plot this year so I am relishing the thought of eating these fresh cobs. Thank you all so much for your kind and thoughtful comments on my last post. I'm pleased to say that after a month in hospital that the patient is recuperating. Sadly still very frail and not back at home yet but able to sit outside in her wheelchair this week and enjoy some summer warmth. A well blended into the background dahlia probably 'Arabian Night'. The remains of the only glad that is still in flower. The others have come and gone in my absence. An unknown grass that would have set seed if I had not been ruthless. A couple of danglies in the shape of amaranthus caudatus 'Viridis'. Scabious stellata 'Sternkugel' which I've not grown before. The flowers are a pretty enough though slightly wishy-washy shade of pale blue but then they morph into rather gorgeous papery seedheads. The vase is my latest find sometime in July from the charity shop that we regularly haunt when we visit our caravan. It has produced riches in the shape of new vases this year. We also have acquired a couple of new outdoor chairs and a little table but more on them another time. I hope to be back here again before too long. In the meantime will try to keep up with the blogs that I regularly visit, although I might be a silent visitor at times. I am trying to be optimistic about my absence from home and have already made some plans and additions to the 2017 wish list, after reading this article on growing cut flowers by Louise Curley (aka Wellywoman) in August's copy of the 'The Garden' magazine. Thanks as always to the lovely Cathy over at 'Rambling In The Garden' for the inspiration and for hosting so graciously each week. I can smell her latest vase from here! Nestling in today's 'In A Vase On Monday' are a trio of dahlias. From left to right are 'Orange Baby', a 'Bishop's Children' seedling and 'Cornel Brons'. To give you some idea of comparative size the circumference of 'Orange Baby' is about an inch. She is the brightest orange you can possibly imagine. The 'Bishop's Children' dahlia is from a batch sown in March. They were grown specifically for a plant sale at the beginning of July. Unfortunately the seedlings were the subject of a veritable slugfest and there were only a few that were presentable enough for the sale. Those in flower went on the day but the others came home with me. I've had one or two nice surprises since as the flowers have opened. I took this photo on Sunday evening knowing that I may not be able to find an opportunity today. It was quite breezy and all three dahlias were revolving in their vases. That and the shape of the' Bishop's Children' bought whirligigs to mind. The third of the trio 'Cornel Bronz' is new to me this year. My vases are in the shape of school milk bottles bought on a recent holiday. I think that may be replicas rather than originals. They certainly seemed bigger when I drank from them as a child but then I was so much smaller. A quick peek over at 'Rambling In The Garden' reveals that Cathy is very much in the pink this week. I'm sure that there will be all the colours of the rainbow in other vases this week. I'm looking forward to visiting them. Summer would simply not be summer without sweet peas. Mine have been struggling this year truth be told, so I am delighted that I am now able to pick in sufficient quantities to hopefully fill vases for some time to come. I sowed one batch of different named seeds at the start of March and the other at the end of that month. Both started life sown in root trainers in the greenhouse before being hardened off and then transplanted at the allotment, where they grow up bamboo cane wigwams. The second batch are definitely looking happier than the first. In amongst their numbers is 'Matucana' which I've grown for years especially for its scent. There is also long stemmed pink 'Gwendoline', the cream with a delicate pink flushed edge 'Mollie Rilstone', sober 'Almost Black' and two toned lavender and pink 'Erewhon' which is fast becoming a new favourite. There is also a mysterious striped impostor which I certainly didn't select as being part of the mix. All in all I think that I sowed some nine or so different varieties so I will try at some point to compose an end of term report on their progress. The vase was probably a milk jug in a former life and is one of a small collection of rosy china that I've accumulated over the years. A quick peek over at 'Rambling In The Garden' reveals that this week our lovely hostess Cathy's 'In A Vase On Monday' includes warm and sunny shades. I wonder what will be in other summer vases. Do have a peek if you haven't already! P.S. Apologies to anybody who has struggled to post a comment here recently especially to those patient souls who have commented twice in order for their comment to be published. I'm having problems myself and have even found myself unable to reply to comments which is so frustrating. I have for the time being turned off the facility for anonymous comments which I'm hoping may make life easier. I'm reluctant to move to another blogging platform but may well do so when I have some time on my hands. In A Vase On Monday ~ "I'm A Little Teapot"
Tip me over and pour me out"
Sadly this particular little teapot has come adrift at some stage from its lid. It's tea pouring days are no more so it's just as well somebody spotted its vase potential. It is now very much re-loved and is filled with flowers today. In this week's vase are the first of the 2016 dahlias in flower, the small white pompon 'Snowflake'. They are the first white dahlias that I've ever grown and I'm delighted with them. I've also grown the bigger white 'Onesta' which is just as pleasing but is too big for this vase. I've added some 'Blueball' cornflowers which are still going strong at the allotment, along with one head of anemone coronaria 'Mr Fokker'. The amounts of rain we've been having have made all the anemones look really bedraggled especially the white flowering 'The Bride'. However I've chopped off all the old flowers this morning and hopefully fresh ones will take their place. Also from the allotment a flower head from one of the fennel plants. 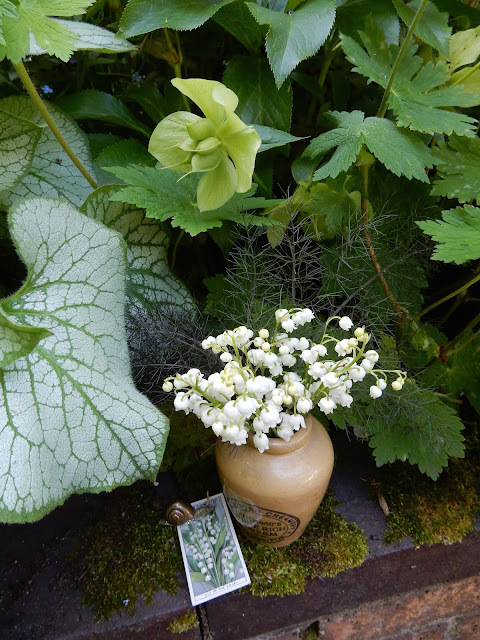 The garden has contributed the dainty white buttons of achillea ptarmica 'The Pearl, the lilac daisy- like flowers of kalimeris incisa 'Charlotte' and last but by no means least a spray of that old stalwart alchemilla mollis. Thanks as always to the lovely Cathy from 'Rambling In The Garden' for the encouragement to pick some flowers for 'In A Vase On Monday'. It's such a gentle start to the week. The intended main stars for this week's vase played up. Firstly the dahlias wouldn't oblige, with just one open flower of 'Snowflake' and one almost open flower but name forgotten dahlia at the allotment. It was interesting to watch the race with the newly planted in a pot 'Snowflake' getting there first. The allotment dahlia has come through the winter in the ground and is going to be a sizeable plant this year. Still one dahlia does not a vase make so I was most pleased to see three flowers of anemone coronaria 'Mr Fokker'. However in my haste I cut one stem too short and beheaded the other two flowers. The air was blue never mind my vase. So in this week's vase are cornflowers 'Blue Ball' and 'Black Ball" and sweet peas from the allotment. In need of a high vis vest a couple of sprigs of vetch, which I picked from a patch growing just outside the allotment on my way out this afternoon. If you screw your eyes hard enough you can just about see them. Finally from the garden some foliage in the shape of lonicera 'Baggesen's Gold' and a trio of the tantalising geum 'Totally Tangerine'. The vase is yet another new acquisition from a trip into Chester last week for a hair cut. I have to pass a charity shop from the front window of which two vases waved at me. I think that this one is possibly a milk jug. With a special thanks as always to Cathy over at 'Rambling In The Garden' for hosting 'In A Vase On Monday'. 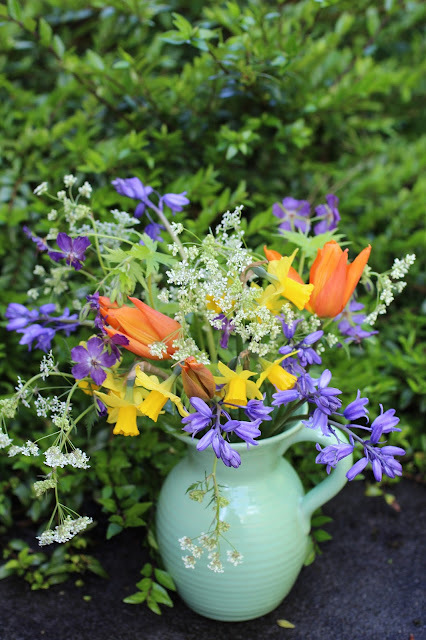 Leaping into this week's summer solstice vase is a mish-mash of pickings from both allotment and garden. Firstly from the allotment there are a few sweet peas which were sown in two batches in the spring. These pickings are from the 1st March sowings. The dull wet weather of the last week or so hasn't prompted many more flowers so I've not been able to pick enough to fill a vase yet. Still a few with their scent are more than welcome. Cornflower 'Blue Ball' has now joined its flowering black flowered sibling. What you can't see in the photo is that many of the stems are wavy. I've not grown cornflowers for years and can't remember if this is the norm. Finally from the allotment the first flowers of anemone coronaria 'The Bride' which is every bit as charming to me as 'Sylphide' though obviously more subtle in colouring. Cathy from 'Words and Herbs' commented on my post last week wondering when anemones coronaria normally flower in the UK. As they are new to my planting experiences I've done some research. In her most comprehensive tome 'Bulb' Anna Pavord writes that "They flower about three months after sowing so if you start them in March you will have flowers in June and July; a June planting provides a September show. Plant in September or October for a traditional display in early spring". Now there's food for thought. I'm sure I had some left overs and although June is well advanced it's worth a go. Joining the allotment brigade are some astrantia the identity of which has long since vanished in the mists of time. This is an astrantia that seeds about a fair bit and that makes me sneeze. It has the aroma of a left too long to linger damp face cloth. Other than that it's most attractive. The vase is residing in the hall so it's anti-social effects will be minimised. Rosa 'The Fairy' seems to be flowering very early this year so I've tucked a little spray in. Lagurus ovatus also known as 'Bunny's Tail Grass' were sown in March and are now a picture of fluffiness. The name says it all. Finally some linaria purpurea otherwise known as purple toadflax. Yes this seeds everywhere but is still a delight. As it is a celebratory vase out came one of the new ones. We saw this in a shop window in Grange-Over-Sands, Cumbria earlier this month. My eyes were drawn to it immediately and an instant decision was made to make a purchase. I hurtled to the shop door only to find that it was shut! It turned out to be a shop that's only opens for a couple of days a week and later in the week at that. A note in the window suggested that if you wanted to purchase an item that you could knock on the front door round the corner but my knock wasn't answered. At this point I was thinking that it was not meant to be as I was returning home the next day. Fortunately himself was staying in the area for another couple of days and was able to return to the shop on the morning it was officially open. The vase was still there and came home with him. There are no clues to its origin on the base. It's a BIG thank you as always to Cathy over at 'Rambling In The Garden' for hosting and nurturing the 'In A Vase On Monday' meme so admirably. A quick peek reveals that her vase this week is a lovely tribute to her blogging friends. I wonder what other participants will include in their vases this week. As always I will have pen and paper to hand when I visit later. Meanwhile I'm off to have a rootle for those leftover anemone corms. Surely the unseasonal rain must stop some time today so that outdoors play can be resumed. Sumer is Iccumen In! A visit to the allotment this weekend yielded treasures including the first flowerings of sweet peas, anemones and cornflowers. There were not enough sweet peas to cut for a vase but I was able to pick a couple of anemone coronaria 'Sylphide' and a couple of cornflower 'Black Ball' blooms for today's vase. It is thanks to Sarah over at 'Homeslip' that I planted corms of 'Sylphide' earlier this spring. I had been smitten since seeing them on her blog. I'm not sure why I have never planted anemone coronaria before and feel that I've been missing out out for years. Working out which way to plant the somewhat wrinkled claw shaped corms was most intriguing. I started them off in pots on the heated sand bench in the greenhouse sometime in March. They were then hardened off before being planting out in a raised bed at the allotment where I grow sweet peas and other flowers. That planting out took place about three weeks ago yet the flowers took me by surprise. They seemed to just suddenly appear out of nowhere. In another raised bed anemone coronaria 'The Bride' is showing colour and hopefully the blue 'Mr Fokker' will follow soon. I'm delighted with 'Sylphide' so many thanks for the introduction Sarah. The cornflowers were sown on 17th March with 'Black Ball' opening ahead of 'Blue Ball' although the latter are showing colour. 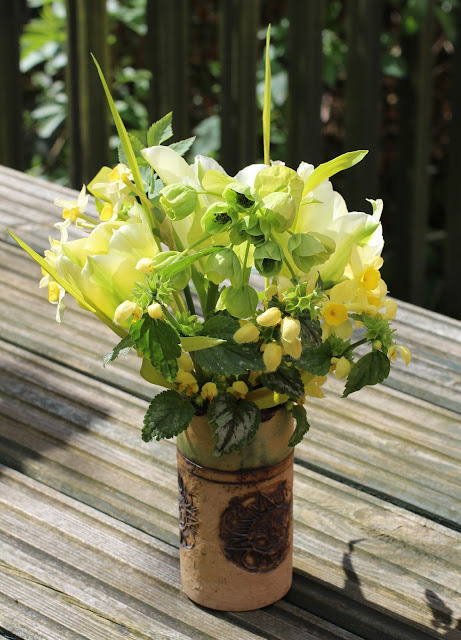 Also in the vase are some stems of briza maxima which were foraged from the allotment site. They grow in profusion in front of the community hut. I've sown and planted some at home too but they are not as advanced. I'm not sure whether this is a wise move seeing how prolifically they self seed ..... time will tell. Joining the allotment pickings are a single stem of rosa' Burgundy Ice', some astrantia 'Gill Richardson' and astrantia 'Hadspen Blood'. 'Gill Richardson' is my favourite deep red astrantia producing large and sturdy flowers. Also in the vase some fluffy pink persicaria bistorta 'Superba', which left just enough room to slip in stems of the shrub physocarpus opulifolius, variety uncertain but probably 'Diablo'. The plan is to fish the latter out later to try and strike cuttings. I was also delighted to come home with the first strawberries of the season but they didn't last long enough to be included in any photos. Although I have acquired a record three new 'vases' in the last week, I'm using an old favourite given to me by my mother after a cupboard clearing session. The new additions came about from a visit to Grange-over-Sands in Cumbria. They include what must be a candidate for the world's heaviest empty teapot. No doubt you will meet them all soon. I see that our hostess Cathy over at 'Rambling In The Garden' is feeling rosy today. Do pay her a visit. The contents of today's vase were picked quickly on what is a very hot afternoon and shade was hard to locate in order for a photo to be taken. Following a few day's absence from home I returned on Friday to be surprised by many openings in the garden including the first roses. The roses you can see above are from the condemned 'New Dawn' which I threatened with the chop last summer. For some reason I did not act on my words and 'New Dawn' has rewarded me by looking more prolific than she has done for some years. 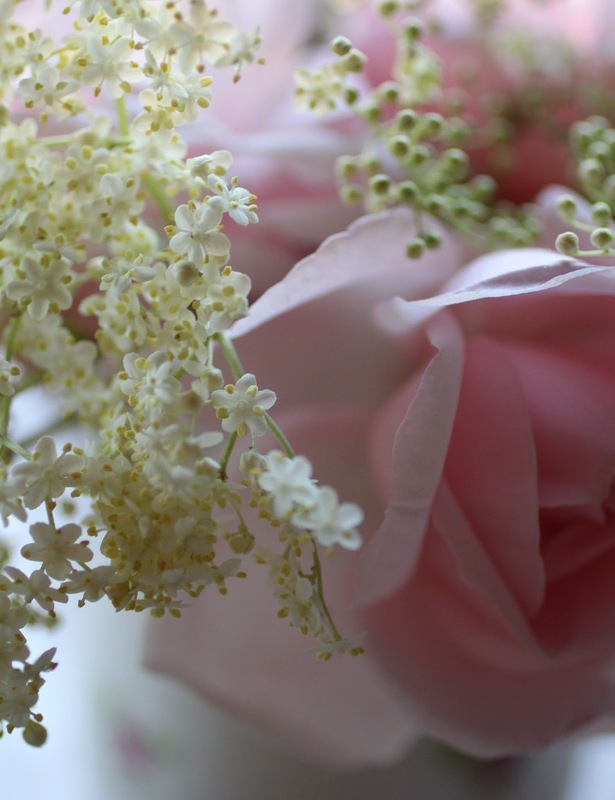 Tucked in the vase with her are some sprays of elderflower. This shrub conveniently leans towards the edge of the garden, from the other side of the stream, where it conveniently grows. Its flowers glow as the light fades on summer evenings. I was tempted to add some pink tinged astrantia into the mix but there was no room. The 'vase' comes from my small collection of flowery china and is intended as a milk jug. This crockery has been purchased over the years from a number of charity shops. The exact details of where it came from have long since vanished from memory. Lending its name to the post title a book which hits the right note for browsing on a day such as this is 'Sweet Days and Roses : An Anthology of Garden Writing', edited by Leslie Geddes- Brown. It's a well illustrated mix of both prose and poetry. This book is no longer in print but second hand copies can be tracked down. Now all that's need to complete the scene is a long refreshing cool drink. Thanks as always to Cathy over at 'Rambling In The Garden' who is the enabling force behind 'In A Vase On Monday'. Vase hopping here I come. Himself absolutely refuses to take to the highways and byways on Bank Holiday Mondays. This goes back to the time when we were both working and set off on a Bank Holiday jaunt into Derbyshire to a plant fair. Going was fine but our return journey met with a huge traffic jam which resulted in an overheated engine. That was that in no uncertain terms, so since then my Bank Holiday outings have been strictly confined to trips to the allotment, which is where I spent a good part of today. Having recently admired a vibrant splash of colour on my allotment neighbour's red geum I was delighted to be given a trio of these plants this morning. Two of the plants have remained at the allotment but the largest came home with me. To help the plant overcome the shock of being lifted, I decided to cut the flowers off. The geums came without a name but I suspect that they are geum 'Mrs J. Bradshaw', a hardy perennial which comes true from seed. 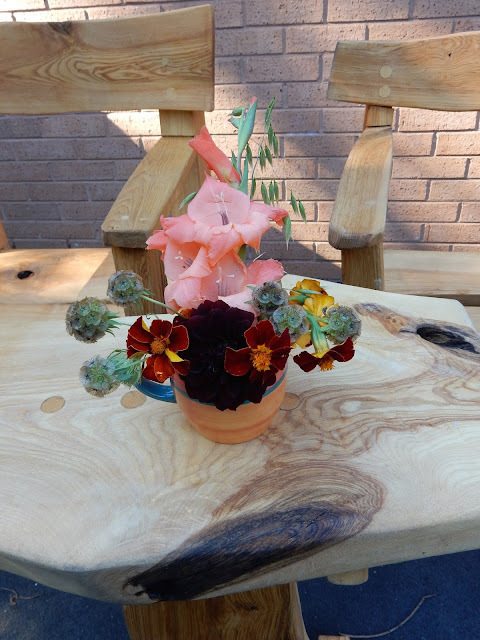 The surplus flowers went into an old glass yoghurt pot and will probably stay outside to decorate the table. In other geum news I've finally got my paws on geum 'Totally Tangerine' after being smitten with it from glimpses on television, magazines and blogs. It's a plant that eluded me for ages and I was so pleased to come across it at local garden centre last weekend. It's joined my other geum the lovely 'Mai Tai' which I hope to feature in a future vase. Thanks as always to Cathy over at 'Rambling In The Garden' and her regular weekly open invitation to share our vases on a Monday. It's a scented vase this week composed of lily of the valley and some foliage in the shape of bronze fennel. The lily of the valley were a gift from my parent's garden. They started off as half a dozen or so 'pips' and have now spread the distance underneath our living room window. Flowering seems to vary from year to year and the plants that are furthest away from the wall are not as productive. It was difficult to do justice to my props, namely a Wills cigarette card depicting the flower and my little bronze coloured snail which normally lives indoors. The cigarette card is one of a set of fifty' Garden Flowers' cards. The snail came to me from my mother as does its companion an even smaller glass snail. Thanks as always to Cathy over at 'Rambling In The Garden' who is the inspiration behind in 'A Vase On Monday'. 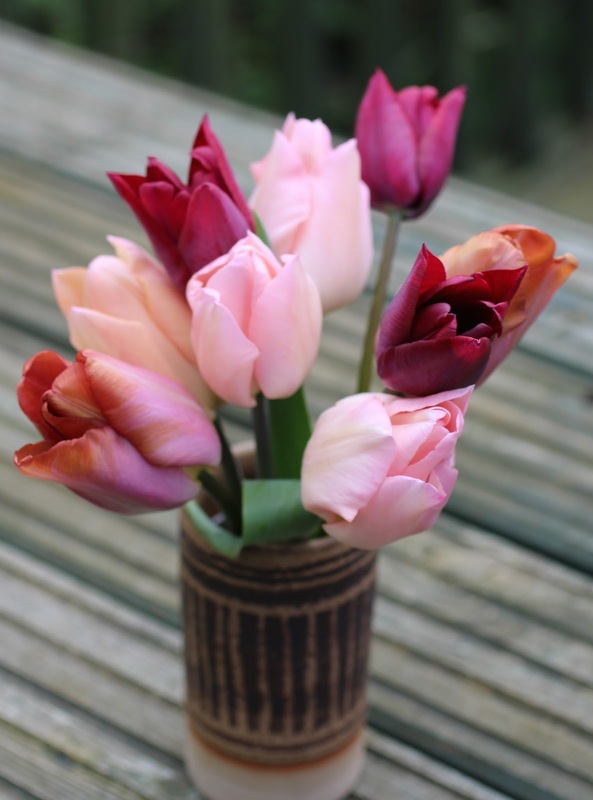 Please forgive this week's 'vase' - himself's hands have been pressed into action to cup the tulips, which would not oblige and sit nicely in a vase. The fact that the stems were of varying lengths probably had something to do with it. Some of my planting was rather late, resulting in some short and stumpy stems, so that the heads were only just above the rim of the vase I had in mind. I must plant earlier this year and yes get a new vase or two. The planned vase was also missing one component, namely tulip 'Apricot Beauty' which went over in the heat of the weekend. So in my pop up 'vase' are tulips 'Graceland' - white with a faint edge of pink, the fabulous frothy and frilly white' Mount Tacoma', 'Malaika' also known as 'Bruine Wimpel' and the double 'La Belle Epoque'. I've not grown either 'La Belle Epoque' or 'Graceland' before and the jury is still out. The former has not lived up to my expectations after reading the catalogue bumph. The colouring has varied quite considerably and not all the flowers have turned out to be double. Maybe though I should try it again as I remember being disappointed with 'Malaika' when I first grew them but this year I've been most smitten. Has anybody else grown 'La Belle Epoque'? If so I would be interested to hear your verdict. 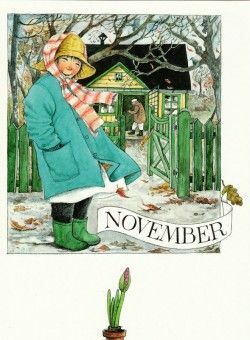 Long term readers of this blog may recall that I really dislike tulip foliage. I get round this by growing them in florist's buckets. I'm lucky enough to have the room to shove them out of sight once the flowers are done and dusted. The buckets are purchased from the local Morrisons's supermarket which sells them in bundles. Each bundle contains at least 8 buckets but quite often more, all for the grand total of 99 pence. The plastic can be a bit brittle when it comes to drilling holes in the bottom but with careful handling they're ok. The buckets also come in most handy at the allotment. On the subject of tulips if you've not already come across garden designer and Chelsea gold medalist Dan Pearson's new online magazine 'Dig Delve' do have a peek. The magazine is about "gardens, landscape, growing and making". You can find a recent most informative article about Dan's experience of growing tulips here. He has the space to try out a number of varieties. After reading it I surprised myself by adding some yellow tulips to my wish list for this year's bulb order. Over at 'Rambling In The Garden', I see that our hostess Cathy has been foraging this week to produce a vase full of wild flowers, set against a backdrop of the seashore. Looking forward to catching up with other Monday vases later on in the day. As with most Bank Holidays there's been the usual blip of rain and wind but it brightened up enough this afternoon to permit some flower picking. This week's contribution to 'In A Vase On Monday' involved a stroll up the lane which leads to the main road. Growing along one side of the sloping bank are cow parsley and bluebells. The latter were already growing when we moved here and their characteristics seem to match those of the English bluebell. The bluebells have been evident for a while now but the cow parsley is only just beginning to open. In another week or so there will be some fabulous frothiness and much sneezing whenever I walk past. Coming back into the garden I picked some late planted, therefore late flowering narcissus 'Tête-à-Tête', three stems of the scented 'Ballerina' tulip and some sprigs of geranium phaeum. The vase is an old favourite given to me by mother some years ago. As usual my flowers were unceremoniously plonked in the vase though I did faff around with them a bit when the vase came in. Well I'm off now to sow some seeds in the greenhouse but look forward to some vase visiting later on tonight. Thanks as always to our hostess Cathy over at 'Rambling In The Garden', who gives us the opportunity to share vases from far and wide on Monday. It's a most gentle and civilised way to start the week. The weather gods seem to have got in for Mondays at the moment - once again it dawned wet and it became increasingly windy as the morning progressed. Still despite the elements not one but two vases have been filled inspired by Cathy's 'In A Vase On Monday'. The first vase is made up of just tulips - namely 'Couleur Cardinal',(thanks Christina for confirming their id), 'Malaika' also known as 'Bruine Wimpel' and 'Apricot Beauty'. The latter is new to me and I was pleased to read that she is scented although I've not detected any scent as yet. Mind you this could just be my nose. I like the way the way the flowers of this morph from an initial pale apricot colour to a soft pink. I'm also rather smitten by the feathering on the 'Bruine Wimpel' flowers which you can see more closely in the photo below. I would have liked another trio of flowers in this vase to bulk the contents out but my plans didn't work out as explained below. The second is a vaseful of yellow and green. I initially put three flowers of the tulip 'Spring Green' in the first vase but the colour jarred with the other occupants. So I sought out some different companions for them. Along with the tulips are a few sprigs of millium effusum aureum (aka Bowles Golden Grass), some narcissus 'Minnow', a flower of mathiasella bupleuroides 'Green Dream' and some flowers of lamium galeobdolon variegatum. I bought the latter many years ago enchanted by Margery Fish's description of foliage and flower but have been trying my best to eradicate it ever since. You can read why I fell for it here. I have now come to the conclusion that it has got the better of me so was quite happy to snip some stems off to go in a vase - tee hee! The vases are my recent lurking in the study finds which are now enjoying a new lease of life after years of holding pens, pencils, brushes etc. Sadly there are no more potential vases in there. With a special thanks as always to our lovely hostess Cathy over at 'Rambling In The Garden' and wishing her all the very best with her imminent wedding posies and buttonholes. You will do a grand job lass. Today's 'In A Vase On A Monday' started with the very first tulip that I could bring myself to cut. Others opened a few days ago but I didn't want to snip them to bring indoors. They are planted in a large container which is situated directly opposite the kitchen window and the flowers lift my spirits when I'm at the sink on domestic goddess duties. I was quite happy to behead the tulips in the vase though as they will be in for the chop soon. Of three varieties planted in a galvanised washing tub it's the only variety that's in flower this year. I'm not sure what it is but it may be 'Couleur Cardinal'. I also picked two other tulips from the same source which are just showing colour. The tulips's companions are narcissus 'Thalia' and a couple of lunaria that I grew from seed last year. The first is the purple leaved 'Chedworth' which is a biennial. The second is the perhaps misleadingly named lunaria annua 'Corfu Blue', which is apparently a short lived perennial. You can see it in the above photo. In the flesh the flowers have an almost luminescent quality about them. I'll be more than happy if it is perennial albeit short lived. Also in the vase are three sprigs of euphorbia. I've always shied clear of growing euphorbias because I suffer from skin allergies. However this one grew all by itself in the garden. Gloves were worn when snipping. I don't think that it was happy though as it flopped almost immediately. Maybe it will be perk up later. Today has seen mainly cloudy skies accompanied by gusty winds so taking a photo was challenging. Too dark indoors but outside the vase toppled over on its side, so the arrangement in the photo you see was not the intended effect. I just wanted to capture the vase before it could go flying again. The vase is the second vase that I unearthed in the study a few weeks ago. It has been used for years to store pens and pencils. I think that it may have been a charity shop find but have no clues to inform me other than 85p written on it's underneath. With thanks as always to Cathy over at 'Rambling In The Garden' for the inspiration which is much appreciated. March began with great excitement when we caught sight of a bird in our bird box, which you can see to the side of 'Is it Bill or Is It Ben?' It was only almost five years to the day since himself set up the box complete with camera. We have in theory been able to watch live streams from Bird TV in our living room since instalment but it has never been high up the ratings until now. After a couple of years of emptiness himself moved the box. The beginnings of a nest were constructed the following spring but then something must have gone amiss as it was abandoned. 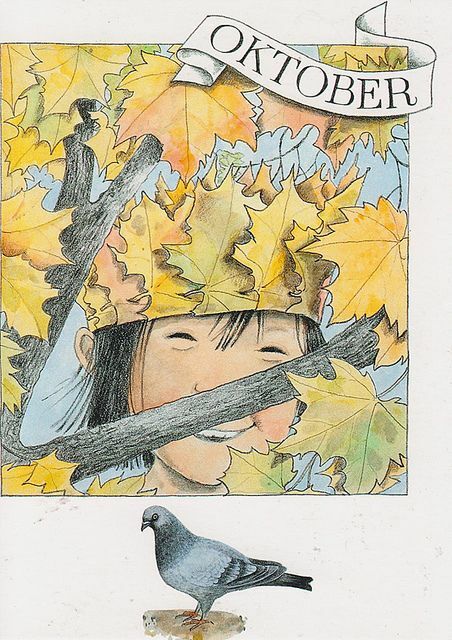 So when we saw the first appearance of what looked like a leaf, followed by more nesting material and then a glimpse of bird's legs you can imagine the euphoria. However it looks as if this was the first and only glimpse of Mama Bird that we will glimpse. What was a reasonably clear picture has disintegrated into a fuzzy morass. We think that the nesting material has been pushed up right against the camera thus blocking the picture. We can hear sounds including though so we know that the box is occupied. There are no babies as yet but when they hatch we will certainly hear them tweet although we will not see any open wide beaks. March continued with some gentle gardening activities including dividing and seed sowing. The heated sand bench in the greenhouse has gone into operation. A batch of sweet peas went in on the first of the month and then a second on Easter Day. Other sowings include achillea ptarmica 'The Pearl', aquilegia 'Miss M.I. Huish', snapdragons, cornflowers, grasses, scabious, orlaya visigna, limonium suworowii, amaranthus caudatus and cobaea scandens. The only vegetable seed sown to date are 'Onward' peas sown on St. Patrick's Day but there will be a flurry of activity in this department once we are well and truly into April. Some dahlia tubers have gone into pots but there is still a pile waiting for me to plant up. I have some concerns about the quality of the dahlia tubers I received but only time will tell. I've made a mental note though to order early this year rather than leave it to last minute. The greenhouse is still quite full with pots of special snowdrops which need shifting out into the outer world. I've put the bigger pots out and will probably move the smaller ones out next week. They are in crates so can be shifted back under cover if any really cold weather is predicted. March ended with a sunshine, big bumblebees afloat, a delivery of two new special snowdrops, chestnut leaves unfurling and the flowers of geranium phaeum sneaking up on me. You can catch up with other versions of March over at 'The Patient Gardener's Weblog'. Many thanks for hosting each month Helen. Now it's back to Bird TV for me and the rustling and chirping soundtrack.